Having an ample supply of electronic research sources on hand is essential for the writer. While more sources can always be added, old ones deleted, or at least placed in a “rarely used” folder, it can be beneficial to organize them to include descriptions as a means of identifying what topics can be derived from for various articles or stories. This is where cataloguing comes in handy, and best of all, no fancy software is required to complete the job. Any spreadsheet like Excel, or OpenOffice Calc, can be used. Only a few columns need to be created, and one spreadhseet file can contain as many tabs as required, each tab containing a different writing topic. The most important thing is, the catalogue is arranged to be of greatest use for the writer, and since it is electronic, can always be modified somewhere down the road for ease of use. Electronic research sources can be bookmarked in a browser, to be sure, but can also be saved with detailed information as to what type of information it holds. For example, a browser bookmark might read “William K. Everson Collection”, and might also be filed under a folder titled “Research materials”. Were “William K. Everson Collection” to be catalogued, it might also include the following as a description: “Publicity Materials: Press kits and press books”, since this is the primary link used for research purposes at the landing page of: http://www.nyu.edu/projects/wke/. For something more general such as a foreign newspaper archive like Delpher, which is Dutch, the description can be “Dutch digital newspaper archive”. Suppose a writer decides to write several articles under the blanket topic of comic books. Some obvious research sites might include Comic Book Plus or Public Domain Super Heroes. Depending upon the subtopic being written about, more research sources might be considered, even if they are not explicitly comic book oriented. For example, the subject might be about famous historical women like Calamity Jane, who has appeared in more than one western-themed comic book. 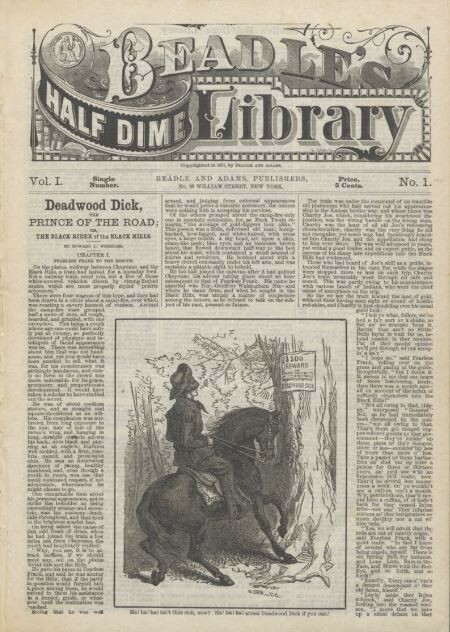 Yet she also appeared in Beadle’s Half Dime Library Issue #1 in 1877, a youth oriented publication containing stories of many genres. Such an intriguing fact would be desirable to include in the article, even though these publications are not considered to be comic books. Beadle’s Half Dime Library might include a description of “19th century publication database including scanned issues”. Experiment with spreadsheet layouts (please see example below), and include only information that is relevant for research purposes.